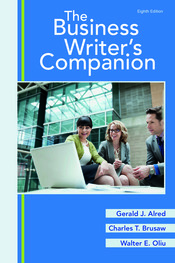 The Business Writer's Companion is the best guide to the business writing essentials that help students land, navigate, and stand out on the job. Affordable and concise, it’s a comprehensive reference that covers the writing process and features more than 60 real-world sample documents. The eighth edition retains the book's intuitive, easy-to-use organization while adding new coverage of social media, and LaunchPad Solo for Professional Writing takes advantage of what the Web can do with useful digital tips and sample documents. Anticipating the needs of today’s business writers, this is a reference with real-world value, usefully building skills that students carry into their professional careers.